This is a game where students will have to figure out where their classmate was standing by using the compass bearings / degrees and what they have said they could see. 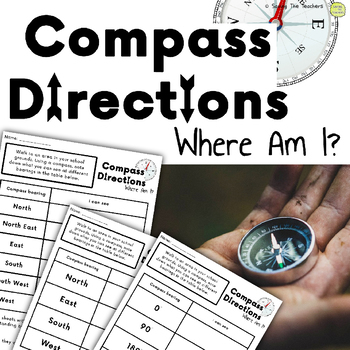 It’s a great way to learn about compass directions and degrees while exploring the outdoors and enjoying nature. 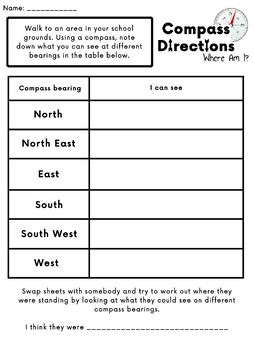 First, students choose a place in the school / outdoor grounds and record on their sheet what they can see at each given compass bearing. 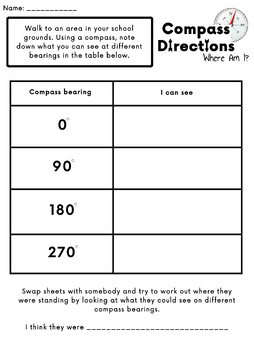 They then swap sheets with a classmate and head off to try and figure out where they were stood by using the information in the table.